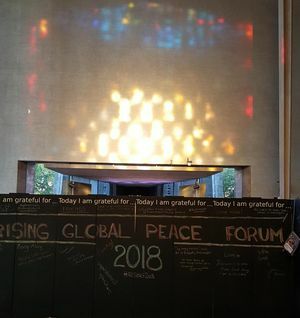 The RISING Global Peace Forum is a collaborative venture between Coventry University, Coventry Cathedral and Coventry City Council that gathers peacebuilders, policymakers and academics from around the world to explore and promote strategies for resolving violent conflict and sustaining peaceful societies. Over two days more than 200 delegates came to Coventry (the UK’s first and only City of Peace and Reconciliation) to hear and talk with two Nobel Peace prize winners and two former Heads of State and also, at a series of 10 workshops, to discuss with leading academics and frontline practitioners, what it takes to initiate contact after violent conflict, make a peace deal and then build and sustain peaceful communities. The Day One speakers included President Ellen Johnson Sirleaf from Liberia, John Bruton who had been Irish Taoiseach just before the Good Friday Agreement was signed 25 years ago, Simon Pentanu the Speaker of the Bougainville Parliament where there had been a civil war in Papua New Guinea, Ad Melkert who had been the UN Special Representative for Iraq 2009-11 and Alastair Campbell who, as Downing Street’s Communication Director, had been close to the centre of power during the violent conflicts in Iraq, Kosovo and Sierra Leone as well as having his own personal journey of peace in living with mental health issues. Tawakkol Karman, Nobel Peace Prize winner from Yemen, also spoke via video link. On Day Two the workshops considered issues about building peace in such diverse places as Baltimore, the Balkans, Colombia, Northern Ireland, Armenia and Syria. The role of journalists in writing and broadcasting about peace and of religious leaders in promoting inter-religious dialogue was also discussed. 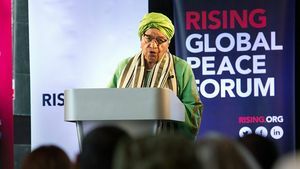 Delegates went away from the 2018 RISING Global Peace Forum better informed and inspired to help build peace in their communities. The dialogue sharing best practice and inspiration will continue online on RISING’s twitter, Facebook and Youtube pages. 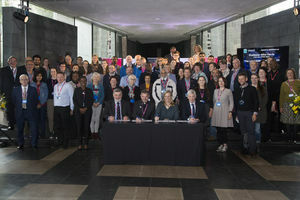 At the end of the Forum the delegates and speakers each signed 2018 Coventry Communique which said ‘we believe that the hard road to hope for our communities is best built by building teams, not walls.’ In so doing they pledged themselves to continue to build and sustain peace and called on all national and community leaders to put peace first.